1) From a distance, shapes will be hard to distinguish. 2) There's already a standard for position (top/middle/bottom), but no well established standard for shape. For horizontal signals, why not re-orient them? Charlie - Thanks for posting. I agree that reflective outlines signals are probably a more cost-effective treatment. I'd suggest one could do both. 1) Agree on the distance comment, especially at night. 2) True, but establishing a standard could be a long-term goal. Regarding horizontal orientation, there are a number of reasons. - Sight distance restrictions, like overpasses between the driver and the traffic signal. - Some current State DOT standards for clearance (distance from pavement to bottom of signal) make it difficult or costly to install signals at the correct height if installed vertically. - For some, "that's the way we've always done it." I'm working on a post about the "different color arrows in the same location" issue. I've seen it with green and yellow (in Seattle and some Kansas City suburbs), but not with green and red in the same signal location. Could you provide some additional information about the location in Worcester. Quebec has had a similar design for many years and now they are relpacing them with standard rousd traffic lights, why? Great post! I am color blind, but it has not had much of an impact on my life. Keep up the good work here! Actually, with the Quebec shape coded symbol traffic signal, you only need two different lens housing. The square red obviously needs its own separate one. You would need something like pedestrian signal housing for that. But for the yellow diamond and green "ball", the standard for the green will work for the yellow. The round lenses could simply be coloured yellow or amber and then have the diamond silk screened or stencilled onto the ball lens. This would reduce costs a great deal. 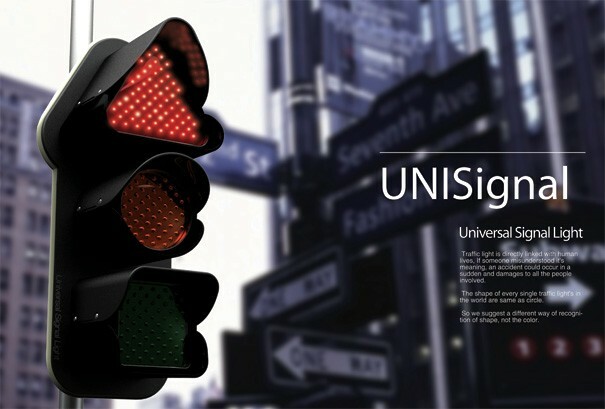 I love these signals and have these lenses in my collection. I also have video of these, which I have filmed in Quebec. I am surprised that associations for the blind haven’t pushed these signal lenses in the US for colour-blind drivers under the ADA. I really thought they would take hold in Canada. I know British Columbia was thinking of using them for a while. PEI does use them. They were used in New Brunswick and Nova Scotia, but never made it to wide spread use. They have since been replaced with standard signals in those provinces. In addition, Quebec stopped using them on provincially maintained highways, but is still legal, there. Still maintained in some municipalities. I have these provincial standards. By the way, these signals are placed in the horizontal position, which you show, and, vertical.